Commercial Buildings - Ino-Tek Inc.
Office buildings, Hotels and other areas where large numbers of people live or work may have need of Gas and Leak Detection. 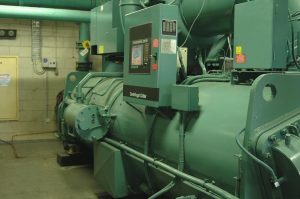 Chiller rooms are especially prevalent in larger commercial buildings and because they use significant quantities of refrigerant – must have detection and monitoring. Many different chemicals are now used for refrigerants, but the most common refrigerants are fluorinated hydrocarbons. These refrigerants are generically referred to by the brand name “Freon”. In addition to fluorinated hydrocarbons, the use of ammonia as a refrigerant is common and presents flammable and explosive hazards to employees work in these facilities. Refrigerant is expensive and properly designed and installed Gas and Leak Detection systems allow discovery of a small leak before it develops into a major problem. If a significant leak occurs, it could trigger reporting requirements to various State and Federal agencies. Virtually all refrigerants are heavier than air and have a faint odor of cleaning fluid. HVAC service professionals commonly experience refrigerant exposure and, while mild exposure is usually harmless, exposure in a confined space can lead to headaches, nausea, and vomiting. Severe poisoning can lead to a loss of consciousness. 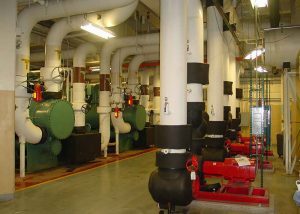 Commercial buildings may also have large gas-fired boilers and the presence of significant quantities of natural gas may also require a Gas Detection system. Additionally, many commercial buildings may have a corresponding parking garage or structure that requires Gas Detection due to toxic vehicle exhaust (See Underground Parking Garages). Many other commercial and industrial buildings may need a Life Safety System if there are hazardous materials present. The Building and Fire Codes have strict limits on the quantities allowed. Ino-Tek can help determine whether the materials present – whether in storage, use or production constitute a hazard that should be addressed. Through long experience, Ino-Tek has determined that Proactive Compliance is the most cost-effective approach when seeking Building and Fire Code Official approvals. A Hazard Review can determine the exposure and outline the required steps for code-compliance.